This kooky summer weather makes it a bit hard to get dressed in the mornings. The temperatures rise and fall from day to day and I'm never quite sure if I'm going to need a light jacket or not. Seeing the photos of these casual cool girls makes me realize a light colored denim jacket might be just the thing to take along on those unpredictable days. * listening to: Mastodon - Crack the Skye "The Czar"
Lately it seems that a lot of people have been asking me the question, "do you like living in Lancaster?". This question is usually followed by an incredulous look and raised eyebrows as if any answer I give other than "no" will be met with utmost skepticism. The truth is, I really do like living here. One of the things I most enjoy is walking around the city and soaking in all of the historic buildings and landmarks. Yesterday Tom and I walked downtown and stopped into Central Market, the oldest still-functioning farmer's market in the States. It's always packed with people and brimming with fresh veggies and fruits from the surrounding farms. Then after market we stopped into Charles Demuth's home, now a museum, and enjoyed a new exhibit and sat in the garden soaking up the sun. It was such a lovely afternoon and all within walking distance of our place. So, while I do miss 24 hour Thai food joints, being able to drive into the desert and Sunday flea markets I don't have any regrets about relocating from LA to PA. I feel like I've been a terrible blogger this week! There are lots of things going on behind the scenes right now that, in the long run, are going to be so exciting for the blog and the shop (a new studio space! new weekly features!) but right now we're in the work, work, work stage and I'm afraid the blog suffered a bit for it this week. However, I did find some time to update the Etsy Boutique with some new goodies for you. Be sure to check it out! Oh, and for those of you who have asked, I ended up ordering my dress form from this store. They have a variety of shapes and sizes with all sorts of bases to choose from. It was delivered in just a few days and so far it's working out perfectly! Yesterday was spent digging through the racks at my favorite thrift store looking for anything that might catch my eye. I wasn't having much luck and was getting a bit discouraged when I saw this dress hanging down the aisle. It was one of those moments when I had to stop and look around and wonder why no one else had picked it up. When I put it in my cart, I half expected someone to take it back and tell me it was a mistake. It needs a bit of a makeover. Someone had pinned tacky plastic flowers around the hips. That was an easy fix. The seams have come undone under the arms and there are a few places where the crocheting has come loose from the fabric (I put a white slip under it for the photos so you could see the details). Nothing that a little time with a needle and thread won't fix. Besides those minor flaws it's in excellent condition considering its age. I just love the details on clothes from this era; the pintucks, the pleats, the cute little bows. And the silk fabric is so soft and light and floaty (is that a word?). It's a smidgen big for me so I'm not sure what it's fate is going be be quite yet. I should probably sell it but I think I might be happy just to keep it around to stare at. It seems that while many print magazines are going under, online magazines are quickly filling the void. I can't even keep up with all of the lovely new issues featuring the likes of fashion, design, photography and DIY projects. Below is a list of a few of my favorites. Are there any great ones I'm missing out on? As much as I'm being drawn to simple black and white looks these days I can't help but notice the liberty prints in the Cacharel collection. Liberty prints have risen and fallen in popularity for decades but I don't know if they've ever looked quite this nice! These are just the types of summer frocks I'd like to wear with sandals and braids on the hottest days of the year. But, since they're well out of my price range I've been brainstorming ways to get around that price tag. One of the advantages to living in the middle of Amish/Mennonite country (besides the wonderful farmer's market!) is finding yards and yards of these liberty floral prints at the thrift store. You see, most of the dresses worn by these modest ladies consist of pretty floral prints. Since the dresses are long and rather sack-like quite a few yards of fabric go into each dress. I always thumb past a few in the racks whenever I'm searching out vintage finds. I usually just pass them by but I think next time I see one I might bring it home to dissect and refashion into a skirt or sundress. I know I'm usually terrible at following up on these DIY ideas (since I always forget to take before/after photos) but I'll try to be better this time! listening to: The Casting Out - Go Crazy, Throw Fireworks "Don't Forget to Breathe"
This weekend was spent living life in 3D, leaving out most of the usual time spent catching up on blog reading or posting. Much fun was had: hanging out with a lovely German house guest, walking around downtown, visiting our favorite architectural salvage store, chowing on Thai food, a quick trip to Goodwill and complaining about the never ending rain. While the time off has left me feeling wonderfully refreshed for the week, it's also left me with woefully little to blog about. My outfits lately have been so simple and basic it seems a shame to even bother posting them. My uniform has consisted of black and white with an occasional accessory thrown in to mix things up. Hmmm... I think there might be a Four Way post in there somewhere. I'm working on adding 20+ items to the Etsy Boutique tonight. This batch includes pretty pink and yellow blouses, 50s cotton day dresses and plaid tops, floral mini dresses, high waisted skirts and the most adorable pastel floral romper! I've got lots more dresses to photograph but I'm holding off because... I finally got a dress form! Yay! After weeks of fruitlessly searching for a vintage one I finally gave in and ordered one online. Of course, with my luck that probably means I'll find the perfect vintage one next week. Ha! As soon as it arrives, I'm going to be adding loads of new stuff to the shop. Thanks so much for stoppin' by! I found these images while searching through the Life Magazine archives. As posed and sort of phony as they look, I still love the idea of having a summer picnic on the rocks by a waterfall wearing cute gingham outfits and pretty dresses. I've really been looking forward to the return of Madmen and this family reminds me so much of the Drapers. Of course, if this was the Drapers that would be scotch in dear old dad's thermos and the picnic basket would be full of cigarettes. Nearly any magazine article you run across touting the “basics” that all women should have in their closets will no doubt include a crisp white shirt. Think classic Carolina Herrera! But that is one basic that has always seemed to elude me. Since I’ve been toying with the idea of simplifying my wardrobe I decided to revisit the white-shirt-as-an-essential rule. I think part of the problem has always been the white shirts I have found just haven’t suited my fancy. They’re either too frilly or too boyish or too boxy or too wrinkly. I tend to be super particular about the fit of my clothes and I’d never found the one that was juuust right. I think those days may be over. I finally found a vintage one that may fit the bill. It’s got the cutest little tag embroidered with a Union Jack that says “Tailored in Nottingham". Since the "white shirt" is pretty much virgin territory for me, I decided it would be perfect fodder for a Four Ways post. The first look is a little bit bohemian, mixing the white shirt with beat up Levi cut-offs, a vest and vintage accessories. I had the hardest time mixing the shirt with skirts but it seemed perfect under this 30s style jumper. Bring out your inner beatnik. This plays into my current obsession with stripes. It doesn't get any easier than this. I threw the white shirt on with a pair of cuffed black jeans, simple flats and a black beret. A striped sweater tops off the look. This was my favorite combination. Hmmm. I was going for boyish but I think I ended up more Amish. In retrospect, this one isn't quite workin' for me! I like the suspenders but somehow the rest of it just didn't gel. I think there's potential here, but it needs a little tweaking. In the end, this was a bit harder than I expected it to be. I thought it would look really classy paired with a black pencil skirt and a scarf, but somehow I just ended up looking like a flight attendant or hotel desk clerk. A navy pleated skirt made me look like I was heading to Catholic school. And then there's the little Amish boy. ;) Despite a few missteps, I can see myself reaching into my closet for this more often than I thought I would. *listening to: Hellacopters - By the Grace of God "It's Good But it Just Ain't Right"
In thinking about stocking my wardrobe with classic basics I keep coming back to stripes. Something about them seem both fresh and timeless. They seem perfectly all-American and yet somehow the epitome of French chic. ... or rather The Cat's Pajamas! It always makes me happy to see the clothes I sell find good homes. To me, each piece has a history and I love knowing that its story doesn't end in a trash heap or rotting away in the back of a closet. Wouldn't you love to know where your "new" vintage dress has been? Was it worn on a special occasion? Did someone lovingly hand make it? Did it go on any travels with its previous owner? I like to think when I ship a dress to Paris or Milan or Japan, whoever wore it first would be pleased to know that their dress is being worn by some stylish girl in a faraway city. It's not often that after I part with a dress I get to see it in its new home. But such is the case with this 30s crepe number. I loved this dress but it wasn't quite right on me. It was just too pretty to waste away in the back of my closet so I knew it had to move on. I think it found the perfect new home with Jessica! * listening to: The Smiths - Strangeways, Here We Come "A Rush and a Push and the Land is Ours"
Sorry it's been a bit of a boring week around here. Honestly the combination of cutting back on spending and loads of rain has left me feeling a bit uninspired. I've been hearing the phrase "shop your closet" thrown around quite a bit lately so I thought I'd give it a try. Last night I took down a couple of boxes from the top of my closet where I was storing some extra clothes and I found a few things that I thought I had gotten rid of. I have to say it was quite fun finding things that I thought were long gone. I switched them out with some dresses that were hanging in my closet. Hopefully, now I'll forget about those dresses and months from now when I take those boxes back down, it'll be like finding treasures all over again. This is one of the coolest things that has happened to me in a long time! 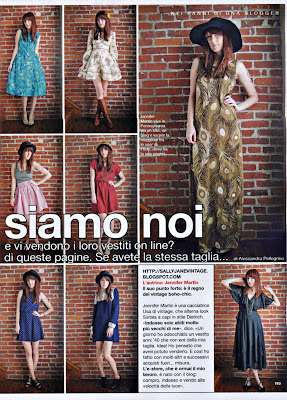 Italian Glamour included my shop among their guide to online vintage shopping. I was so excited when they contacted me about the piece and it's always a bit surreal to see my photos in print. I hadn't been able to get my hands on a copy so the always super sweet Anna from The Cupcake Diary sent me the most wonderful bundle of goodies including the magazine. She was also thoughtful enough to include a translation for those of us who are not Italian savvy. "Jennifer Martin is a US vintage hunter who mixes 60s looks with a Dietrich style. 'I only wear vintage dresses a lot older than me' she says. 'One day I found a 40s dress but it was not my size. I had an idea and thought to sell it. I did and then I sold a lot of other out-of-size purchases. The e-store which is now my job came with the blog. I buy, wear and sell at the speed of light.' "
The text made me giggle a little bit as it's not exactly a direct quote from what I sent in but I guess that's what you get when you translate something from English to Italian and then back to English. Just when I think I know all the best places to shop online, another one pops up that I'm quite sure I'm the last one to know about. Such is the case for CandyStore Collective. It's not a new shop but it's new to me and I spent a good portion of last night doing a little fantasy shopping on the site. They've really narrowed down some of my favorite collections to just the best pieces. It's a store full of the kind of simple summer dresses and rompers that I would love to fill my closet with. This weekend I went to Philly to see Doves play the Trocadero (amazing), went to the opening of the House Industries show, ate a vegetarian cheesesteak with the works, threw a birthday bash for Tom, saw tons of friends, went for a walk around downtown, wandered through my favorite vintage stores, ate strawberry lemonade sorbet, shipped out all my Etsy packages, took no less than four naps, found a pretty vintage skirt at the Salvation Army, played with my cats and watched a Joy Division documentary. Lately I've had thoughts of weeding my wardrobe down to just classic basics. Of course nothing is more classic and basic than a little black dress. And if you had this many bits and bobbins to change it up, who would need anything else? Not that I'm going to get rid of everything in my closet and wear one black dress for the rest of my life... but I can certainly look at this and imagine a hundred new things I can do with the little black dress that I have. ...to see these boys. Be back on Sunday! The other day Tom and I went to check out this abandoned house someone had recommended we see. A lot of the places we explore are in some state of ruin with roofs caved in and birds living amongst the rooms and just general disarray. But this house was still quite intact. It had the most amazing flocked wallpaper in nearly every room. At some point hideous carpet had been laid over the original hardwoods in nearly every color of the rainbow. Each room was a different color! Who would do that?! My favorite part of these places is how the light seems so different than in normal houses. house photo by Tom b. My knowledge of the American Girl dolls is rather limited. It’s not something I had around when I was a little girl. Perhaps they came along after I was a bit old for dolls? My experience with them consists of avoiding the hordes of squealing girls, all carrying their slightly creepy little doppelganger dolls that would gather outside of the American Girl store at The Grove when I was living in LA. So the other day when I was flipping channels on the TV and came across Julia Ormond in a beautiful 30s era floral dress, I stopped to watch, having no idea what I was getting myself into. Then Abigail Breslin popped onto the screen and I thought, oh, I don't know if I can watch this. From what I gathered, she plays the spunky heroine of the story - Kitt Kittredge, a depression era girl with dreams of being a reporter. So... of course I just muted the TV and decided to enjoy the costumes and set designs and avoid the inevitable morality tale. And I was not disappointed! There were lots of lovely costumes to admire on the adults as well as the girls; pretty florals, sheer sleeves, oxford style shoes and straw hats. I'm loving the little side hairbow on Kitt (though it's much too young of a look for me to pull off). I'd be thrilled if I came across any one of the pieces at a vintage store. So, if you can stomach the saccharine kid-friendly story it's actually quite nice to look at. First of all I want to say a huge thank you to all of you reading! I wish I had the time to get back to each and every one of your comments but the minutes and hours just seem to slip away. I swear I have the nicest readers. I know a lot of other bloggers have problems with negative comments* but I've been super lucky to have all of you. It always makes be happy to log into my email and see all of your wonderful comments! I've had a lot of questions lately and while I've tried to answer all of them I know some may have been skipped. So... rather than trying to answer them each individually I thought I'd take a moment to try and address the most frequently asked questions. If there are any I missed that you'd like to have answered feel free to leave them in the comments. *Whoops! Guess I spoke too soon. I think it's hysterical that as soon as I say I don't get negative comments someone leaves one! What blog template do you use? How do you get your photos to show up larger? My blog template is called “Minima Stretch”. I like it because it allows my post to be wider and therefore accommodate larger photos. To choose this template, log into your Blogger account then go to your dashboard; click on “layout” then “pick new template” then choose “Minima Stretch”. In order to have larger photos you have to host them somewhere like Flickr or Photobucket then input the html code rather than uploading them directly through Blogger. Most of the photos used on my blog are taken by me. I have my little point and shoot camera and my (mostly) trusty tripod that I carry around to snap my photos. You can see the set up in the photo above. It involves a lot of running back and forth from behind the camera to in front of the camera and I’m sure appears strange to passers-by that have no idea why I run around town taking photos of myself. Sometimes Tom likes to pitch in and help out which is always much appreciated. When ever he takes photos I always give him a credit underneath. I use a Canon SD1000. It’s several years old, a little beat up and missing the lens protector from a time when a strong wind knocked over my tripod and sent it crashing to the ground. But I love it anyway! It’s small enough to fit in any purse or in my pocket and I find the function keys on Canon digital point and shoot cameras more user friendly than other brands; perhaps because that’s what I’m used to. But here’s the real answer – the one you probably don’t want to hear. Unless you’re investing big bucks in a nice SLR with a great lens, it really doesn’t matter what kind of camera you use. A camera doesn’t take a great photo – you take a great photo. So no matter what kind of camera you have, just learn to use it well. Read the manual! Learn about the ISO, the shutter speed, the aperture, how to use the macro feature for close-ups. I never, ever put my camera on an automatic setting. I’m constantly adjusting the exposure, the white balance, the ISO to get the best results possible with my little beat up camera. What program do you use to edit your photos? How do you put those frames around your photos? I use Photoshop CS3 to edit my photos. I really didn’t know that much about Photoshop when I started blogging. Luckily my graphic designer boyfriend gave me some pointers to get me started. From there I took a couple of great online tutorials to expand my knowledge. And really, I’m still just scratching the surface of the things Photoshop is capable of doing. But I figure there’s nothing I can’t learn by Googling it so anytime I’m stuck I just Google away until I find what I’m looking for. The best thing I’ve learned is working in layers. All of the frames I use are applied using layers. Do you ship to (insert any country here)? I haven’t received my package; can you give me a tracking number? Yes! I will be happy to ship to you anywhere in the world. All domestic (US) packages are shipped via USPS Priority Mail with delivery confirmation. All international packages are shipped via USPS First Class International Mail. Rates start at just $11.99. Shipping times vary as packages must pass through customs. Unfortunately First Class International packages do not come with a tracking number. If you require a tracking number for your package I will be happy to upgrade your shipping to Priority but it cost at least twice as much. How do I start my own Ebay/Etsy store? This is always a tough one because I think everyone has a different path to starting their own store. My best advice is to make sure it’s something you’re going to love doing. Because there are days when it is much more work that you’ll ever imagine it will be. Most Ebay/Etsy stores are one-woman-shows. The person running it is responsible for finding stock, photographing it, writing up descriptions and measurements, packaging and shipping, customs paper work and endless trips to the post office (the PO will not pick up international packages). It’s sort of an endless cycle but if you truly love doing it, it’s worth it. *listening to: Richard Hell and the Voidoids "Blank Generation"
Yesterday Tom and I went to Longs Park to walk around the pond and watch the geese. There were lots of adorable little goslings that I couldn't help but stalk. Once I got close enough mama goose did that creepy head-down, tongue-out hissing thing at me and took the babies into the water. It was such a beautiful day. The kind of day when the sun is just right and the breeze is just right and you don't want to go inside.